Low Turnout In Referendum Throws Macedonian Name Change Into Question The referendum to add "North" to Macedonia's name fell far short of the required 50 percent needed to be implemented, but the country's prime minister is pushing for the measure anyway. 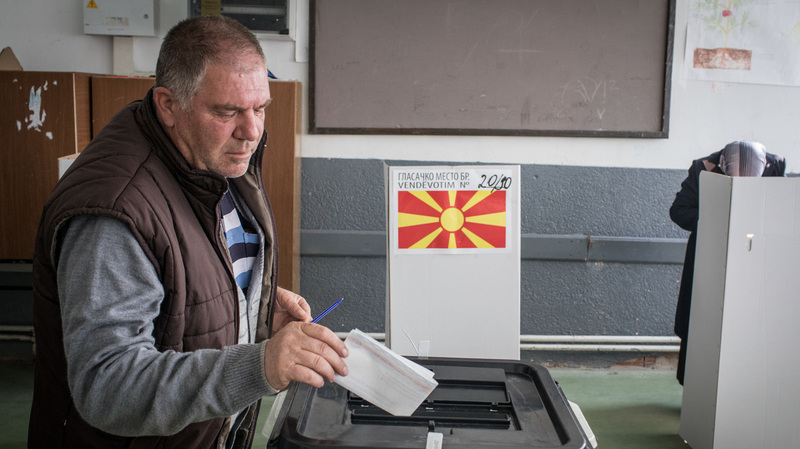 A man casts his vote at a polling station on Sunday in Tetovo, Macedonia. Macedonians all across the country went to the polls to vote in a referendum to change the country's name to the Republic of North Macedonia and end a long running dispute with Greece. A vote on a referendum to change Macedonia's name in an effort to end a decades-old dispute with Greece won overwhelming support from those who voted, but fell far short of the 50 percent turnout required to validate the change. The controversial referendum was to change the name of their country from Macedonia to North Macedonia — a move aimed at mollifying the concerns of Greece, which has threatened to block its entry into NATO and the European Union unless the name is changed. However, under the Macedonian Constitution, if turnout is less than 50 percent, the results of the referendum would not be binding. According to The Washington Post, voter turnout stood at 36.8 percent. Half an hour before polls were to close, voter turnout stood at 34 percent, according to the AP. That figure was based on data from 85 percent of polling stations, according to State Electoral Commission head Oliver Derkoski. Protesters in Macedonia, who pushed for a boycott of the vote, appear to have been largely successful. Notable critics of the referendum include Macedonian President Gjorge Ivanov, who called the agreement a "flagrant violation of sovereignty," The Associated Press reports. One referendum protester in Macedonia told NPR's Joanna Kakissis, "It is not dignified, it is humiliating, that I must not call myself a Macedonian, the only name I have for myself, and for my ancestors, and for my children, only because of a political deal and a diplomatic deal." Prime Minister Zoran Zaev, who leads the governing Social Democrats addressed the media on Sunday after the voting, saying "the will of those who voted now must be turned into political action inside Parliament." Greece's refusal to recognize Macedonia as a country has barred it from participating in international groups, such as NATO and the EU. Greece insists Macedonia designate itself as "North" to differentiate the country from Greece's own province of Macedonia, the birthplace of Alexander the Great. The dispute goes back to the early 1990s, when Macedonia declared its independence from Yugoslavia. The ballot question asked: "Are you in favor of membership in NATO and the European Union by accepting the deal between the Republic of Macedonia and Republic of Greece?" In June, after months of negotiations, Greece and Macedonia reached an agreement to change the name in exchange for Greece dropping its objections to Macedonia's NATO membership. According to The New York Times, those strongly against the name change argue a better deal was possible with Greece.